Let me start by saying to all you family and friends out there who find out that your loved one has cancer.... your not alone!!! 45 million new cases of cancer pop up every year. That's right, 45 million, which is a lot of people who don't know what to say to their loved one. The most important thing you can do is mention the situation in some way that feels comfortable for you. You can show interest and concern, you can express encouragement, and/or you can offer support. Sometimes the simplest expressions of concern is the most meaningful. And sometimes just listening is the most helpful thing you can do. Remember the old saying “big ears small mouth” When in doubt, respond to the news from your heart. As well meaning as you want to be to someone you know, or someone you knew, with cancer , it seems like we are all doomed to say the wrong things. Stan Goldberg, a professor emeritus of communicative disorders at San Francisco State University, says that “it seems as though no matter how good our intentions are, there is no way of asking how someone is during and after treatment''s, not to mention, well after they have gone into remission”. One things for sure, is that you don't state the following things...“Don’t worry about it,” “You’ll be fine,” “We’ll battle this together,” “They’ll find a cure.” . Yes, one would think these things would be calming to the patient, encouraging and positive but in reality, you might as well be saying “I know your sick or dying, but I want to tell you its ok.
A diagnosis of cancer can tie the tongues of friends and family members or prompt them to utter inappropriate but well-meaning comments. Some who don’t know what to say simply avoid the cancer patient altogether, an act that can be more painful than if they said or did the wrong thing. Say your at a family gathering, a happy event, this is where your stuck between a rock and a hard place. You want to recognize your friend or loved one in what they are going through, but you can't ask them how they are feeling, nor can you simply ignore them, so what is one to do?. Talking to our clients here at AJ'S Wigs, our clients report, that simply asking … WHAT CAN I DO TO HELP WHILE YOUR GOING THROUGH THIS? Words of optimism may work in the short run, but in the long run they can induce guilt if the cancer is more serious and defeats a person’s best effort. We find, that setting up their support system is so much better. Our Patients would rather hear their friends ask them if they can make a casserole for their family or, offer to help clean the house or take them shopping. Others say if someone offered to shop for groceries, care for children, take the dog for a run, or accompany the patient to the doctor. But one thing to remember, is that if you offer to help with things, you have to follow through because if you don't, it can make the patient feel like he/she is a burden. • Don’t talk about other patients with similar cancers, even if they fared well — no two cancers are alike. It’s fine, though, to ask if the patient would like to talk with someone else who’s been through it. • Don’t say the patient is lucky to have one kind of cancer rather than another, which downplays what the person is going through. There’s nothing lucky about having cancer even if it’s a treatable cancer. • Don’t offer information about unproven treatments or referrals to doctors with questionable credentials. • Don’t suggest that the person’s lifestyle is to blame for the disease, even if it may have been a contributing cause. Blame is not helpful. Many factors influence cancer risk; even for lifelong smokers, getting other cancer is often just bad luck. • Don’t preach to the patient about staying positive, fit or eating healthy, which can induce feelings of guilt in the patient if things don’t go well. Better to say, “I’m here for you no matter what happens,” and mean it. • Don’t ask about prognosis. If the patient volunteers that information. It’s O.K. to talk further about its implications. Otherwise, it’s better to stifle your curiosity. • Don’t burden the patient with your own feelings of distress, although it’s fine to say, “I’m so sorry this happened to you.” If you feel overwhelmed by the prospect of interacting with a person with cancer, it’s better to say, “I don’t know what to say” than to say nothing at all or to avoid the person entirely, who may then feel abandoned and think you don’t care. Now, for those of you with cancer, don't assume that your friends or loved ones know how to act around you. The best thing to do, is to engage in open and honest conversation about general things and if you want to bring up your cancer, ask them if you can talk about your cancer. In other words, engage in conversations and less in question and answer conversations, and above all, don't have preconceived ideas. Going back to family and friends,One of the most important things to remember is never give the cancer patient false optimism such as, “You will be fine”. Yes, one would think these are encouraging words, but they are not. It’s also tempting to say that you know how the person feels. But while you may know this is a trying time, no one can know exactly how any person with cancer feels. So, all these don't do's really limit a family members reactions and encouragement, but let's take a look at the do's. What do you call bugs with cancer? MalignANT and BEEnign. What do you call a doctor who is always on the telephone? A man isn't feeling well, so he goes to see his doctor. The doctor examines him, and then asks to speak with his wife. The doctor tells his wife that her husband has cancer. The wife asks "can he be cured?". The doctor replies "there's a chance we can cure him with chemotherapy, but you will need to take care of him every day for the next year - cooking all the meals, cleaning up the vomit, changing the bed pan, driving him to the hospital for daily treatments, and so on". When the wife comes out to the waiting room, the husband asks her what the doctor said. The wife answers "he said that you're going to die". What's the difference between God and a Doctor? God doesn't think he's a Doctor! On board a flight to Hawaii, the pilot announced, "That thump you heard was our last engine conking out. I'm really sorry to tell you this, but we are going to crash into the ocean." In the stunned silence that followed, an angry voice spoke out. "Dammit! That stupid doctor of mine! He said I was going to die of cancer." "He lied!" A patient visited his urologist for testicular cancer and expressed concern about being able to perform after the operation. 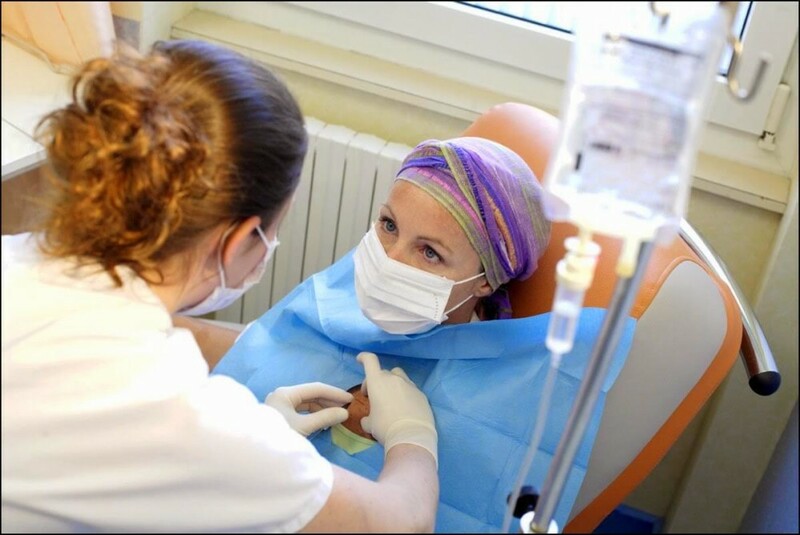 The patient was also worried about the chemotherapy. The doctor said "I too had testicular cancer a few years ago. Ten days after the operation I made passionate love with my wife, and forgot all my worries. Try it and see for yourself." Three weeks later the patient returns, and thanks the doctor effusively. The doctor says "I'm glad my advice helped." The patient thanks him again, and as he's leaving says "By the way Doctor, you have a really beautiful house. Two old baseball buddies with lung cancer were chatting on a park bench. Paul says, "I hope they have a baseball team in heaven." "Me too", says Jack. "Tell you what", says Paul, "If I die first, I'll give you a message about whether there is baseball in Heaven. If you die first, you can do the same for me." A year later, Paul is dead and Jack is sitting on the park bench when he hears: "Jack, it's me, Paul. I have great news! Guess what. There really is a baseball team in heaven." "Thank God", sighs Jack, "Now I can die in peace." "I'm glad you feel that way," says Paul, "because you're pitching tomorrow! A lady with bone cancer had trouble getting to sleep at night because of the pain. To make matters worse, her tomcat's yowling would wake her up just as she fell asleep. "I don't need this," she raged. She had the tomcat neutered. A few months later she found an ancient lantern up in her attic. Just for kicks, she rubbed it. Immediately a giant genie appeared and offered her three wishes. First, she wished to be cancer free. It was done. Next, she wished to be young. It was done. Amazed, she asked for the third and final wish. "Bring me a handsome young prince." The genie looked around and the only living thing in sight was her cat, which he immediately transformed into a handsome young prince. She swooned into the prince's arms. When she awoke, the prince said, "Darling, I'll always be at your side, but aren't you sorry you had me neutered?" Anyway, you get the idea. No, there is nothing funny about cancer, but humor sure can cure many things and laughter can increase many positive things in the body such as blood pressure and heart rate. The concept that comedy could improve health makes some medical sense. Studies show that anger, depression, and pessimism impair the immune response, increase surgical recovery and wound-healing times, and can even contribute to higher death rates. And what better way to counter a negative outlook than through a dose of comedy? "Humor and distressing emotion cannot occupy the same psychological space,"
Lee Berk, DrPH, a pathology professor at Loma Linda University in California, is among those who have tried. In a series of studies, including one published in the December 1989 issue of the American Journal of Medical Science, he examined before-and-after blood samples from subjects who had viewed humorous videos and from a control group who had not. He found significant reductions in stress hormones and enhanced immune function -- including increased natural killer cells -- in the video-watching subjects. "God doesn't give you more than you can bear." Platitudes, niceties, etc. only serve to make the speaker feel less awkward, invariably making everything more awkward. There is only one thing you should ever say: "I will be here in any way you need me in any way I can, and every few days I'm going to ask if you need something specific, like a cleaning or a meal. Take me up on it or don't, but I'm not offering out of pity; I'm offering out of love." Most people put on brave faces and unless you have been through cancer, we must be careful as to what we say. As stated above, the best thing you can do, is to show your support. Be there for them and ask what they need from you..